Somebody in the comments suggested that we show pics from open heart surgery. Nobody lies about heart surgery. There's no controversy over heart surgery. Abortion supporters spread misinformation about abortion. They say that it only eliminates "a blob of cells". They say that the unborn are only human beings at a stage far past the first trimester. Abortion displays are intended to counter this propaganda. If pro-lifers were lying about what aborted fetuses looked like, all they would have to do is obtain comparable pictures and display them. It would be easy to debunk. Instead, they hide the truth. The truth undermines support for abortion. Now there have been some attempts to counter this imagery. However, in these pictures, pro-aborts never show what happens to the unborn. 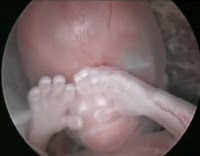 One pic I remember shows an embryonic sac. Another shows the cannister containing the "products of conception". Nobody cares what happens to non-fetal tissue. The issue is what happens to the unborn. You will never get such pictures from abortion supporters. They know it would undermine their cause to show such pictures.